Durian, the king of fruits is a fruit where people either hate or love. 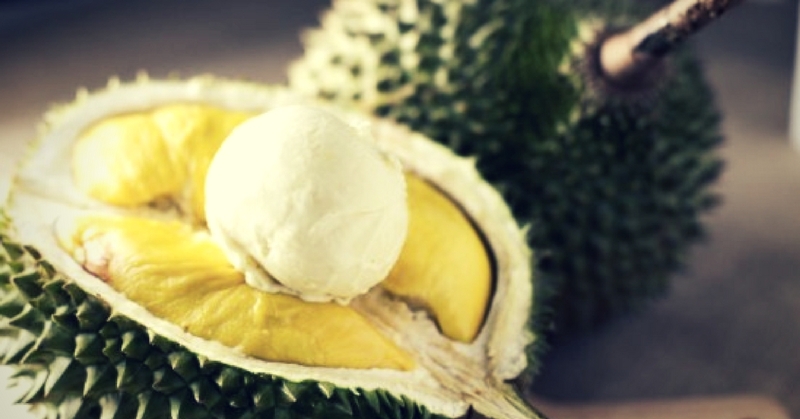 Good durians are only able to enjoy during certain season of the year. Besides the green spiky fruit itself, there are also durian flavored delicacies that are equally good to satiate your cravings. There are a few local ice cream brands which sells Durian flavored ice cream, and Inside Scoop is one of it. Inside Scoop’s ice cream are all hand-made and comes with variety of local flavors, such as Teh Tarik and Cempedak, and now they have durian! Do note that this is not your ordinary durian flavored ice cream as they use the real D24 Durian to make it. You can also pair them together with their delicious waffles! The cravings for Baked Cheese Tart has been going around quite some time. Baked Cheese Tart was one of the greatest pastry for cheese lovers. Hokkaido Cheese Tart up their cheese tart game another notch with their Durian Cheese Tart, which is made with fresh D24 durian. One-bite durian puff is one of the popular must-eat in Malacca. The durian puff’s filling is made of pure durian paste. Getting just one durian puff is never enough for durian lovers. Do look for “Taste Better” for the authentic one-bite durian puff. If you’re too broke to get the real fruit or too far to get your hands on the above durian pastries, you can always count on this popcorn durian snacks. The Durian popcorn can be found in most grocery stores. While the durian taste in the popcorn is not as strong as the items from the list above, it makes a good snack while catching a chic flick.